Create your own outdoor oasis with outdoor lounge furniture that's perfect for relaxing. The Sandpiper Sectional is one of our favorite options. It's a comfortable sectional with classic colors to coordinate with any home. The sectional and lounge chair come together as a set and provide seating for 7. The coordinating multi-use table is a unique height so it's comfortable for conversations and eating. Made of aluminum frames with resin wicker and Nuvella fabric cushions, this set is crafted to stay outdoors. For a smaller space, the Davenport Conversation Set is a great versatile option. With a sleek metal design this set includes a sofa, chair, cocktail table, and end table providing seating for four people and plenty of space to share snacks and drinks. The durable aluminum frame is built to withstand the elements and features a subtle x design at the side of each piece adding a beautiful design element throughout. 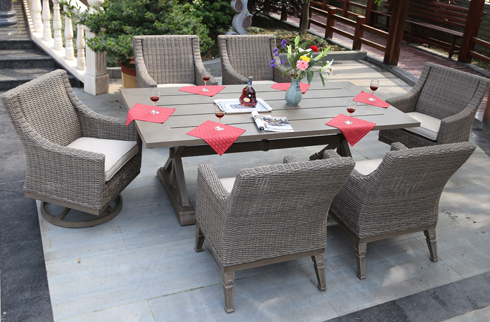 Accommodate the whole family with the Calistoga 7 Piece Dining Set. This Outdoor dining set includes beautiful detailing on the legs of four side chairs and two comfortable rockers at the ends of the table. The table itself features a beautiful trestle design that certainly will impress your guests as soon as they graze your backyard. For a smaller space, the Bay Breeze Round Dining Set seats four in a reasonable amount of space. The rich dark brown finish of the rust free aluminum frames make this set stand out against your green backyard. The painted glass top features a unique 'leather-like' appearance for a different look. The sling chairs are comfortable and feature a cut-out design for added visual interest. The Calistoga Outdoor Fire Pit set allows you to extend your summer days into summer nights. Entertain no matter the weather with a signature fire pit in your backyard. This fire pit table features a slat design at the top and four large lounge chairs fit perfectly at end side to complete the set. Gather with friends and family for the best stories shared around the Atlantic Fire Pit and Chair Set. Four comfortable outdoor swivel lounge chairs fit perfectly around the round fire pit table so everyone can join in the conversation.